These days, spring practice for high school football means many things to many different people. Of course, coaches have to present the image that the t-shirt and shorts workouts that take place over the next month or so will somehow have an impact on the upcoming season. In the past, that might have been truer than it is now. With year-around workouts and conditioning and specialized training and private 7-on-7 passing teams, players rarely fall out of football mold, thus making spring practice a cute blip on the calendar the exact results of which are never known. Skeptical as one might be, there are still developments that could happen and eyebrows that could be raised during said spring practices. There are situations that bear watching and we’re here to help point them out by asking the five burning questions of spring practice. 1. 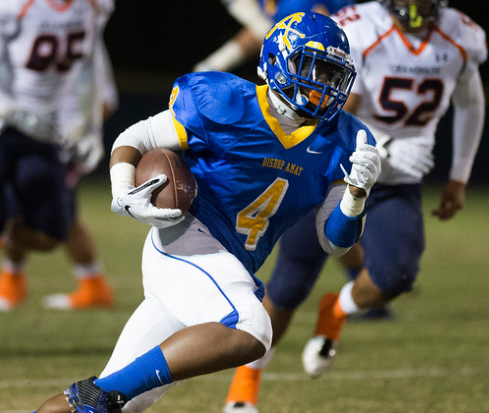 Will Torreahno Sweet rejoin Bishop Amat football team? Perhaps the biggest development of the offseason was the dismissal of Sweet from the Amat football program. We don’t know the reason and have only heard speculation as to why this happened. But make no mistake, without Sweet, Amat isn’t going to live up to the lofty expectations this season. When Sweet emerged as a viable force midway through last season, that’s when Amat took off. Sweet ran for over 851 yards despite starting half the season. It’s paramount Amat has a ground game to go with all that talent on the outside. Such was proven last season. There are rumblings that Sweet will be reinstated soon, and if that happens, Lancers fans should breathe a big sigh of relief. 2. Who will be the starting quarterback at Bishop Amat? We’ll stay in La Puente for the second question. Yes, it’s that important. When last year’s original starter Damian Garcia got injured late in the season, backup Ryder Ruiz stepped in and won the biggest games of the season. With both players back and healthy, the question about who’s the starter looms. This one likely won’t be answered during spring practice. It probably won’t even be answered during the summer passing circuit. But the race figures to be so tight that anything either player does no matter when will loom large. Another thing to keep an eye on during this spring is any and all signs that Amat is planning to solve this luxurious problem by going to a two-quarterback system. Can you imagine a two-quarterback system with Amat’s fan base? Yikes! Earlier this offseason, we wrote about the potential traveling plans of Baldwin Park standout offensive lineman Francisco “Paco” Perez. At 6-foot-5, 300 pounds, Perez is a rarity around these parts. With college offers starting to roll in and still no head coach at Baldwin Park officially announced, who can blame Perez for looking around for a better place to play this fall? And Perez has reportedly done just that, sniffing the linens at Bishop Amat, Cathedral and La Mirada this offseason. But supposedly he hasn’t left Baldwin Park yet. The key thing as the Braves begin spring football will be to see whether is an active participant. If he is, there’s a decent chance he stays. If he’s not, well, then you know a move is likely forthcoming. This one can be answered easily. Just simply show up to a Monrovia practice and see if the bodies match the same type of talented frames that have played for the Wildcats in recent years. They’d better because San Marino looks ready to end Monrovia’s reign of success in the Rio Hondo League. Plus, you’d hate to see the Wildcats become something less than great especially after CIF moved the entire Rio Hondo League up on Monrovia’s behalf. 5. How will La Mirada’s new faces adapt? Participating in “conventus” has to be a bit of a shock for the several players who transferred to La Mirada this offseason. Think about it, for these new faces their first official team function is something as grueling as the 5 a.m. workout known as conventus … but it may feel more like Navy SEALS tryouts. Head coach Mike Moschetti is adamant, though, that the players like it and nobody matriculates through his program without going through it. The bet here is some of them wish they waited a bit longer to transfer. Once the Matadores make it to the field in a couple of weeks, it will be interesting just how talented this group is. La Mirada has a ton to replace from last year’s team, but word is that the talent level may be even better this fall. Charter Oak, Valencia, Hart, Workman, Fontana, Cathedral, Etiwanda, AB Miller, Norte Dame and Culver City. FYI: Bishop Amat defeated Charter Oak Valencia in last year’s championship. Temple City has fired head coach Rob Castaneda after one season. The Rams went 3-7 in Castaneda’s lone season. The Rams have had a hard time hanging on to football coaches since a successful run by alum Mike Mooney from 1998-05. Castaneda was confident when he was hired that he could handle the hurdles that the once-proud program faced in terms of lack of participation and being undersized. Castaneda was previously at Ribet Academy for three seasons. His son Tim, a Temple City assistant, played locally at Los Altos and Bishop Amat, as did Tim’s brother Matt Castaenda. The decision to leave St. Francis for Santa Margarita will cost former St. Francis High School standout wide receiver Dylan Crawford half of the regular season next fall, according to a CIF-Southern Section ruling earlier this month. Crawford won’t be eligible to play for Santa Margarita until Oct. 5. He is currently eligible to compete in track and field for the Eagles, though. 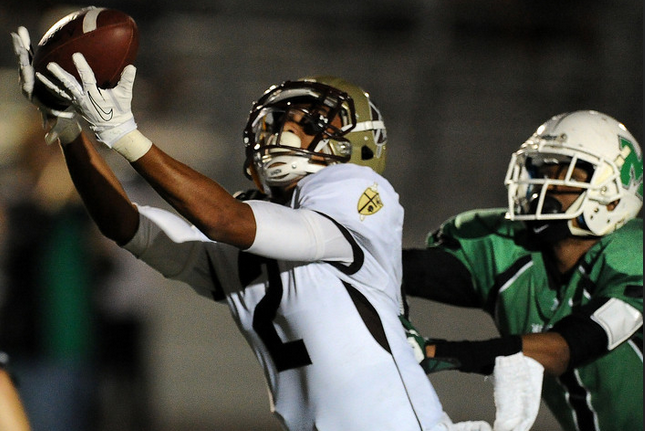 Crawford is one of the top receiver recruits on the West Coast. He was a two-time Pasadena Star-News All-Area performer while at St. Francis but shocked many people around these parts when he decided to transfer to Santa Margarita in what his father, Glenn Crawford, called an academic decision. Crawford has college offers from Miami, Michigan, Notre Dame, UCLA and UCLA, among others. He had 44 receptions for 1,006 yards and 13 touchdowns last season. Crawford plays for Body By Tra’s offseason 7-on-7 team, which is quarterbacked by Santa Margarita starter KJ Costello.